In 1965, The Four Tops had a number one hit on the USA Billboard and R and B Charts with their song, I Can’t Help Myself (Sugar Pie, Honey Bunch). Aside from being a catchy tune that your parents might have held hands to in the back seat, why is this important? Because the maligned Super Rugby conference system appears to have validated the final rankings and delivered the four top seeds – each conference winner plus the highest ranked wildcard – into the semi-finals. Chiefs fans might argue that their side would cause more anxiety for the all-conquering Crusaders than any of the Hurricanes, Lions or Waratahs might do, but this would overlook the obvious point that they weren’t good enough to get past the Hurricanes and earn the right to turn speculation into fact. 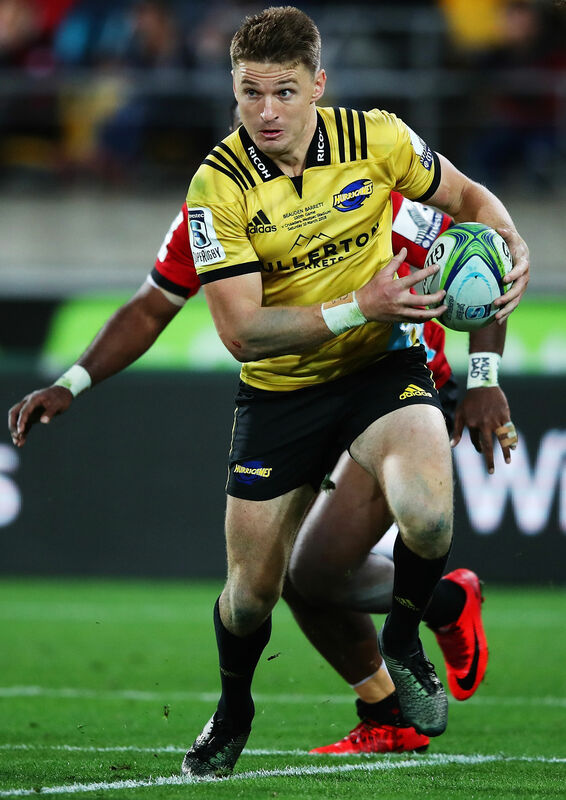 The Hurricanes – seemingly rudderless and toothless over the last couple of months – found a renewed focus and handled the Chiefs far more decisively than a tight 32-31 score-line suggests. On a blustery night, their tactical approach was far superior, using Ngani Laumape to punch through the midfield, and Gareth Evans and Sam Lousi to lead a far more urgent forward effort. Beauden Barrett has attracted criticism in recent times for not displaying the ‘wow’ moments fans have come to expect, but one thing he knows about playmaking, that his opposite, Damien McKenzie, is still learning, is that being the conductor doesn’t mean that you have to play all of the instruments yourself. TJ Perenara also shrugged off a couple of ordinary weeks, twice running solo from a 5m scrum to score. This perfectly illustrated the Chiefs’ malaise – their timing and situational awareness just a wee bit off – but it also spoke to a solid Hurricanes’ forward platform, and Perenara showing what a force he is when he stays disciplined and fully focused on his own role. The Sharks fell behind in a flash, 13-0 to the Crusaders, and their option to kick for goal from a penalty seemed to bely their stated intention of taking the game to the champions. They stemmed the bleeding for the middle period of the match, but a gaping wound had opened up by the end. Crusaders 40-10. The Waratahs’ 30-23 win in Sydney was a shock, not for the extent of the 17-point deficit made up, but because the class gulf between the sides in the first half was so vast, it was impossible for anyone watching to believe how a Waratahs victory could be possible. Praise was heaped on halfback Nick Phipps for putting his body on the line, claiming a loose ball, and showing his teammates the level of effort and commitment that was required. 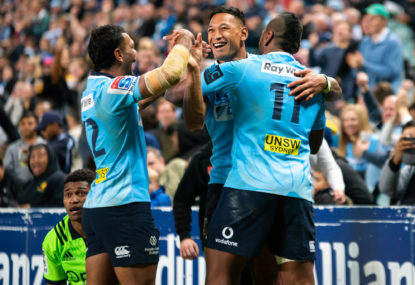 But to suggest – as many did afterwards – that the Highlanders wanted it more in the first half and the Waratahs wanted it more in the second, is a gross over-simplification. The key moment was a decision by Aaron Smith, with his side ahead by 17 points, inches from the Waratahs’ goal-line with the defence stretched to breaking point, to pass flat and wide instead of calling on a forward runner. 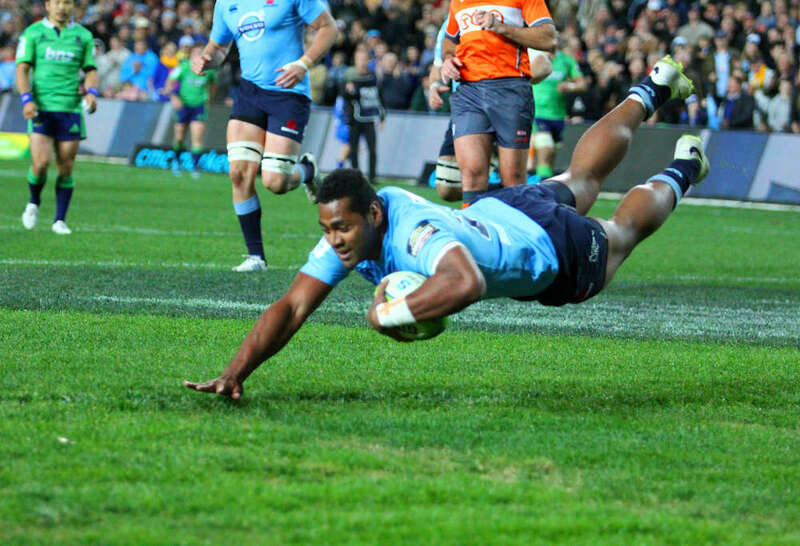 It’s a ploy that Smith has employed with spectacular success many times in the past, but the difference here was that with the goal-line so close, and the Waratahs’ defenders not required to be set back behind the last feet of the ruck, all Smith succeeded in doing was to hit Taqele Naiyarovoro on the chest. A harem-scarem, length-of-the-field scamper and two Waisake Naholo high shots later, and the game had suddenly become an entirely different beast. With the rampaging Waratahs adding 21 points in ten minutes, the ‘cards ruin matches’ argument was surely gaining more traction. But Naholo’s yellow card had precisely the effect it should have – to penalise the offending team and allow the opponent – if good enough – to convert their numerical advantage into points. Here was a lesson on how to play a man up. The Waratahs lifted their intensity and the speed of their recycle, not allowing the Highlanders sufficient time to cover their flanks. And with space to burn, Israel Folau ran straight and hard, affording him support options inside and out. The Highlanders would get another opportunity late, after Shannon Frizell was stopped agonisingly short. But again it was their senior players, Smith and Lima Sopoaga who showed a bewildering lack of patience, trying to score off first-phase ball, instead of working a 14-man Waratahs defence around to their advantage. Sopoaga did provide the post-match highlight however, having just played his final match for the Highlanders, calling Rod Kafer ‘Kearnsy’ – surely the ultimate insult. And so it was left to the Lions to confirm their semi-final spot, which they managed without any real concern, 40-23 against the Jaguares. The visitors didn’t help their cause by playing naively – Emiliano Boffelli wandering aimlessly into no-mans land to gift Ruan Combrink the opening try, and then, in the second half, too often running one-out, straight into the clutches of turnover specialist Malcolm Marx. The Lions on the other hand showed all of the experience gained from recent finals campaigns, tempering their helter-skelter tendencies and relying instead on intensity at the contest and a totally dominant scrum. With SANZAAR under heavy criticism for not pursuing a strategy of employing ‘neutral’ referees, it must be said that refereeing was overwhelmingly a non-issue all weekend – validation of the strategy to employ the best referees, regardless of origin. The only remotely curly matter came when Glen Jackson and his TMO Glenn Newmann – in the very week SANZAAR announced a review of TMO protocols – got their communication mixed up when adjudicating Perenara’s first try. Although they probably reached the right outcome soothed any concerns over the process. Angus Gardner somehow let the Waratahs distract him into allowing them to burn a minute to set the final scrum of their match – he should have called time-off as soon as it became clear that the Waratahs had no interest in forming the scrum. But really, there were only the barest of crumbs for referee bashers to nibble on. Of greater concern was a Fairfax Media story providing some of the detail behind the Amanaki Mafi/Lopeti Timani incident, following the Rebels final-round loss to the Highlanders in Dunedin. Suffice to say it makes for uncomfortable reading. With the matter now before the court, and Mafi faced with the possibility of watching next years’ World Cup from Milburn, Otago, instead of playing for Japan, one imagines that only the closest scrutiny would be applied to any reporting of the matter. Curious then that the chronology of events – as stated in the report – had Timani and Mafi drinking with Mafi’s relatives while watching the Sharks versus Jaguares match at 1.00am on Sunday morning. The match actually didn’t start – South Dunedin time – until 3.05am. Yesterday saw the New Zealand Sevens Women retain their World Cup title with a dominant 29-0 win over France in the final. Excitement machine Michaela Blyde was rewarded with a hat-trick, while there was fantastic action throughout the day; Ellia Green on fire for the Australian women as they claimed third place over the host nation USA. Rugby administrators looking to unpick their way through the TMO maze might care to notice how Sevens rugby seems to manage the process far more efficiently than is currently the case in Super Rugby and International rugby. TMO interventions are sparse, and when they do occur, there is an obvious emphasis on immediacy as well as accuracy, the officials cognisant that Sevens is a game of speed. The method is on ‘one look, make a decision, get on with it’, with players and fans either too exhausted, or focused on the next play, to stop and argue the toss. There was also stark illustration of how Sevens has evolved into a game where the kick-off has become the key set-piece in the game; the Fijian men in particular making great use of the brilliant ball-player, Leone Nakarawa. Despite eagerness from attackers and defenders to contest the ball, there was a notable absence of the type of controversy generated by Israel Folau’s challenge on Peter O’Mahoney in the third Australia versus Ireland Test match. It will be interesting to know what Rugby Australia CEO Raelene Castle – in San Francisco for the event – brings home. 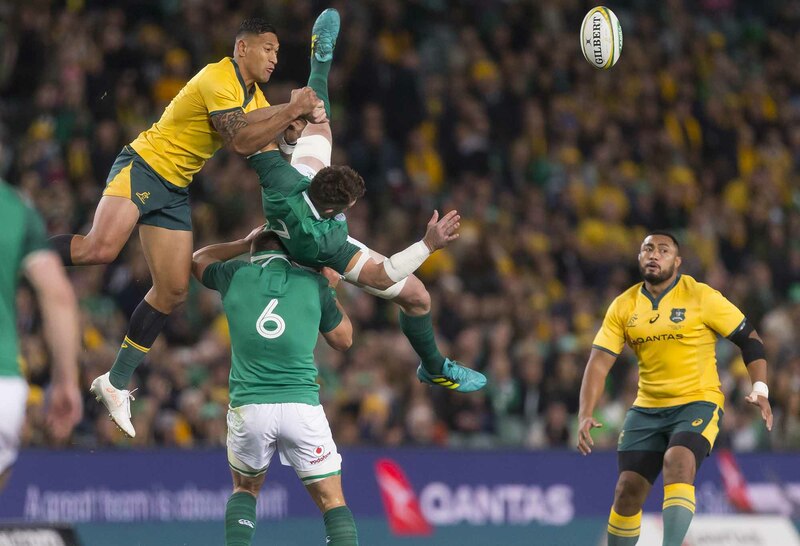 Will it be a will for Australia to continue its complaints to World Rugby about unfair treatment of Folau, or a tape of the action; to show Folau how other players go about competing for the ball at the kick-off without fouling their opponent in the air? There is enough to fix in rugby without needing to find fault in other sports, but disaffected rugby fans might care to cast their eye over rugby league and ask themselves if their own concerns are really as bad as they make out. At a political level, there is conflict in rugby league between those who wish to build on the success of the recent World Cup and grow the international game, and NRL clubs unwilling to share ‘their’ players. At club level, try watching the Bulldogs versus Parramatta clash from Thursday night, and be able to tell one team from the other. More importantly, in light of rugby’s determination to protect player’s heads, it is concerning to observe what happened to Wests Tigers’ 250-game hero Robbie Farah, during their Saturday clash against South Sydney. 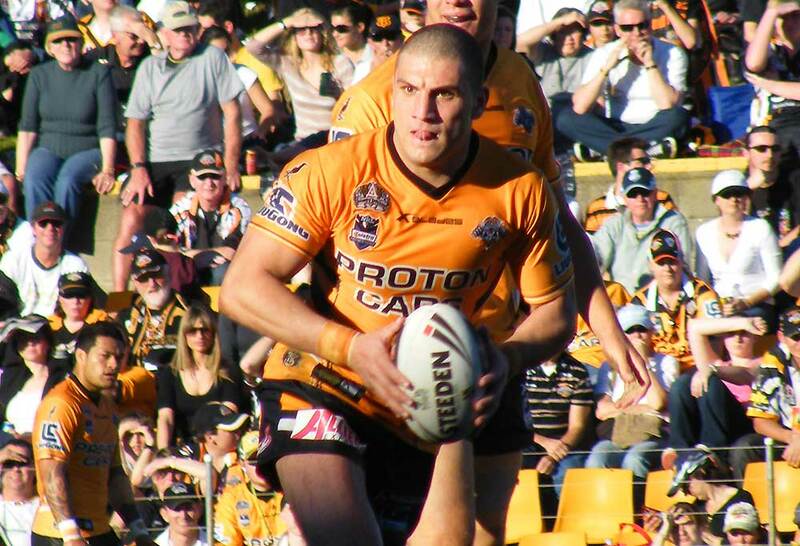 Farah was taken from the field in the 71st minute after a sickening head clash with the Rabbitohs’ George Burgess. Accidental and unfortunate, but there is more to the story. In the first half Farah was felled by a brutal shot by Sam Burgess, contact with arm and shoulder sufficiently high and forceful to warrant a red card had it occurred in rugby. Burgess was subsequently placed on report by the match officials, although he was exonerated yesterday, thus avoiding his third suspension of the season. It is rugby league’s business to establish the standards that it wishes to adhere to. But watch Farah go to ground after he is hit, dazed, bleeding from the mouth and, by his own admission afterwards, concerned that he may have lost teeth, such was the force of the hit. That he wasn’t taken from the field for a concussion test is an indictment on the sport. That Burgess was allowed to stand over him, calling him a “weak c**t”, is another. And the fact that the match commentators could be heard in the background laughing it all off was very disappointing. Farah has a history of head injury problems that stud his career. Among numerous instances, in a 2013 State of Origin match he was heavily concussed and allowed to stay on the field. In 2016 he underwent brain scans after a period struggling with the effects of concussion. Rugby union might be struggling right now to find the correct balance between player safety and preserving the physical elements of the game, but rugby people should at least be thankful that the emphasis is in the right place. I’ll take any supposed injustice suffered by Ed Quirk ahead of what happened to Robbie Farah, every single day of the week.